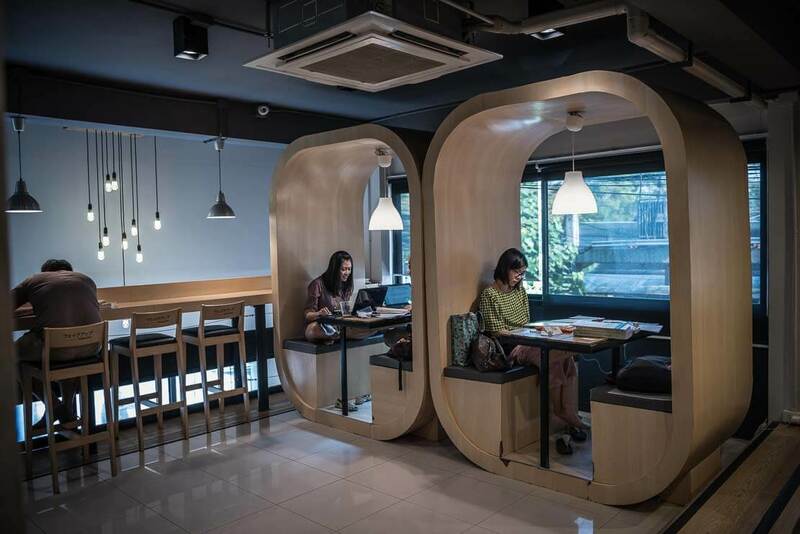 Co-working spaces are a modern response to the rise of freelancers and digital nomads around the world. We think this concept needs a standing ovation. 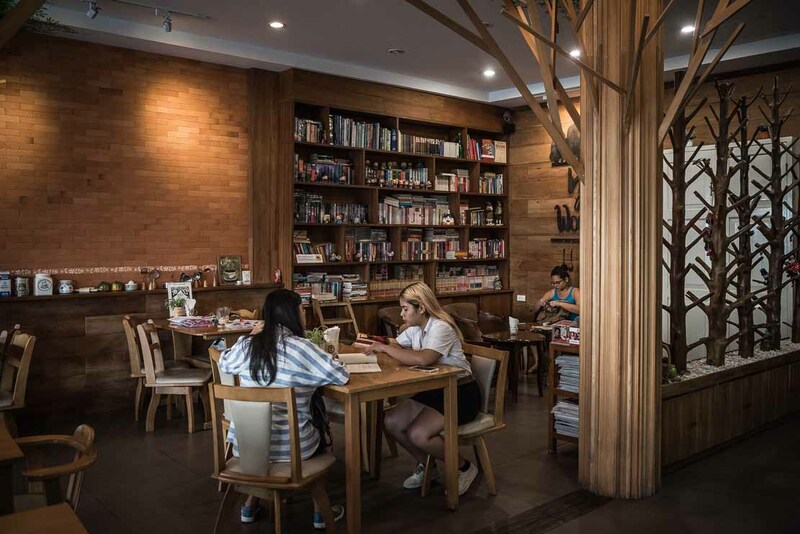 Co-working space phenomenon is developing fast in many countries but Chiang Mai has become the number one hotspot in Asia, if not in the whole world. We made Chiang Mai, a mountainous city in the Northern Thailand, our home for a month to create our website. To be able to work, we needed a few things – a table, a chair, fast and reliable Wi-Fi, air-con and that nobody disturbs us. Chiang Mai in May is scorching hot, with the thermometer showing above +40°C. In this heat, air-con is like a scuba for a scuba diver – it’s a tool of survival, not just a “nice thing to have”. As we were going to work all day on the computer, working from our guesthouse, a small room with a fan, wasn’t an option. We decided to try a co-working space. We have heard about it before but never used one. It was a wonderful discovery. 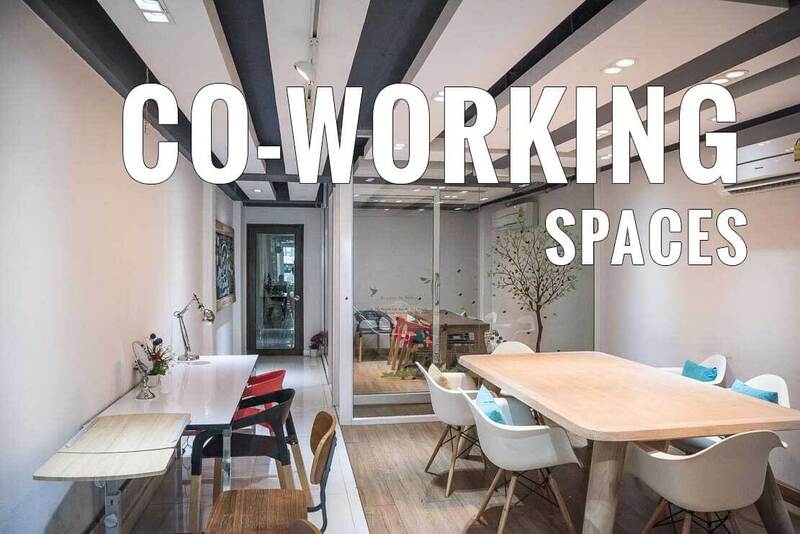 For those who don’t know, the co-working space is a model where people share a common space for their work. It’s like an Internet café ten years ago, with a modern twist – people now come with their own laptops. 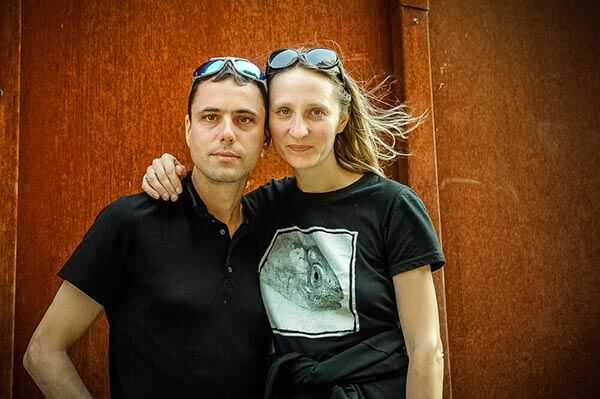 The clients are mainly students and people working remotely (freelancers, digital nomads and alike) who come to work side-by-side, have a cup of coffee, meet new people, watch a film or even have a nap. 1. Traditional co-working spaces is where you “buy” space and Internet access. For a small fee you are offered modern and comfortable conditions to work – a workstation with air-con and access to Internet. They also provide drinks for free (don’t expect real coffee but rather Nescafe, tea and biscuits). For an additional fee, you can also rent a conference room. You can buy a one-day pass or a monthly subscription. 2. The second option is cafes where you can use a space and Internet (usually for 4 hours) against the purchase of a drink or food. You buy a drink there and call it a co-working space. 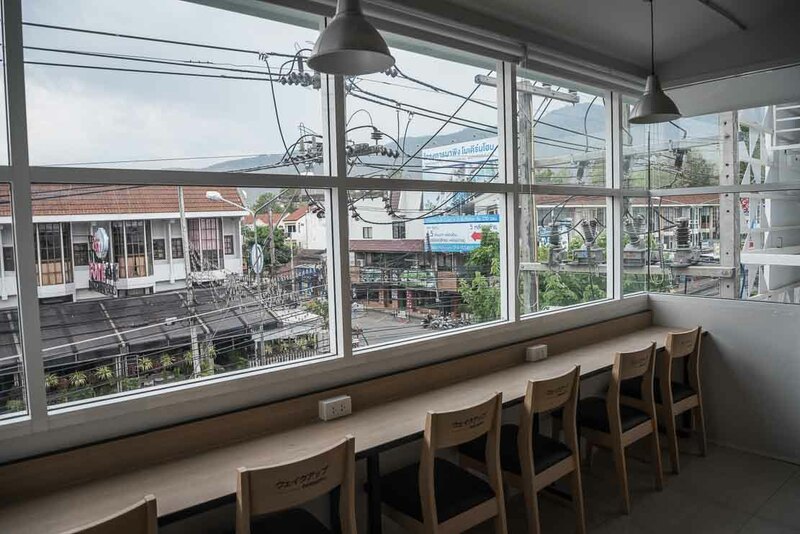 Best co-working spaces in Chiang Mai? Having a choice is good but having too many choices can be intimidating. 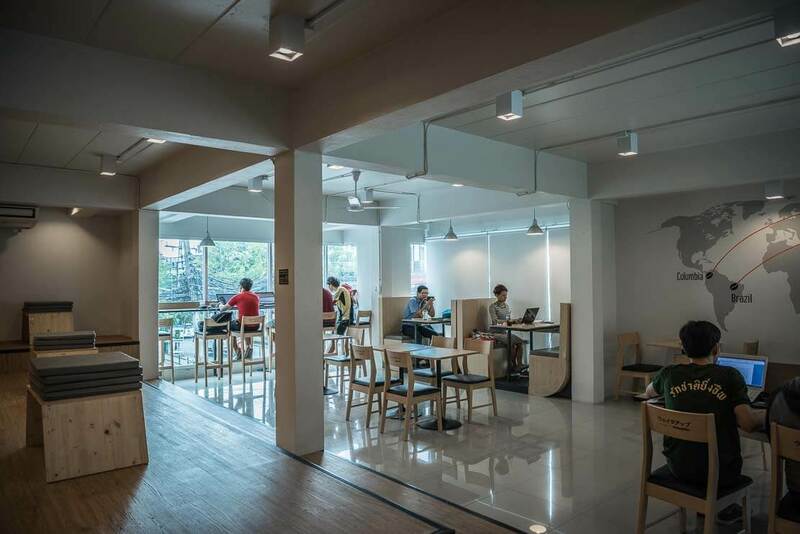 We quickly found out that the number of co-working spaces in Chiang Mai is impressive – all very modern and stylish, spacious and well equipped. 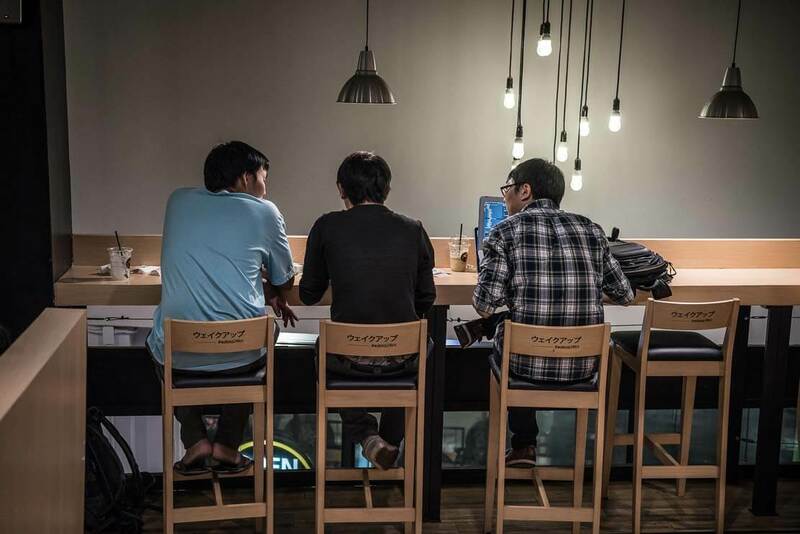 There also hundreds of cafes, which can be used to work. None of the places is alike – atmosphere, services, location, design etc. are all different. We all have different tastes too after all. 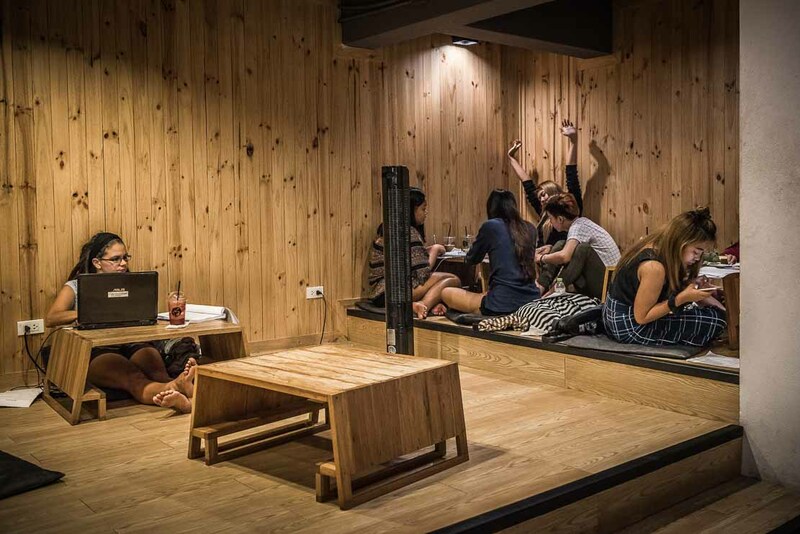 We are not trying to find the best co-working spaces in Chiang Mai. 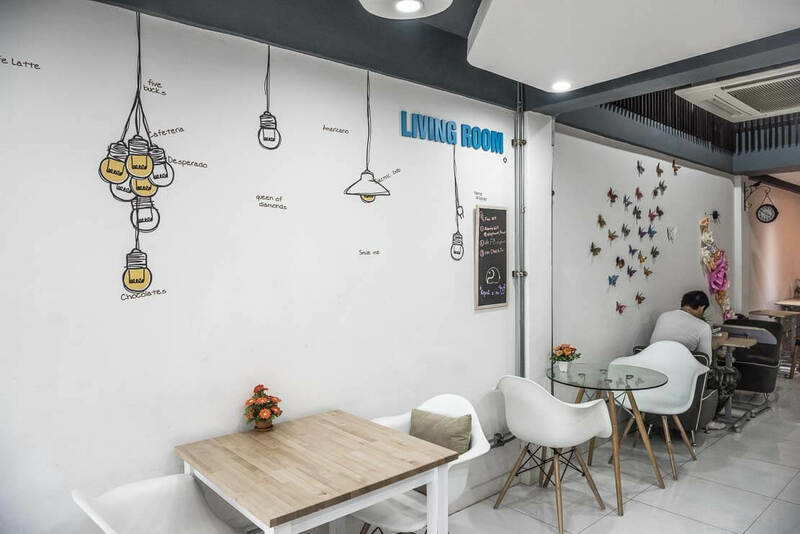 Instead, we are sharing the list of the co-working spaces and cafes for digital nomads that have become our personal favourites. 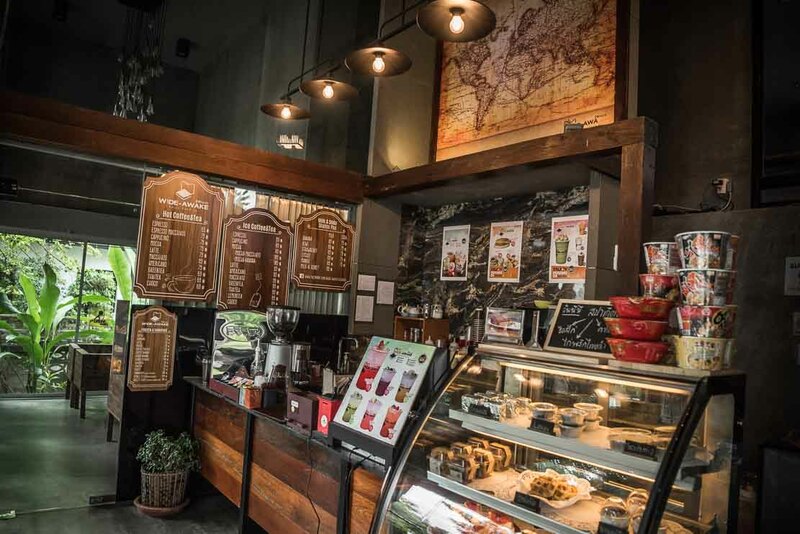 We tried several places, but we ended up working mainly at “Wake Up” in the trendy Nimman area. 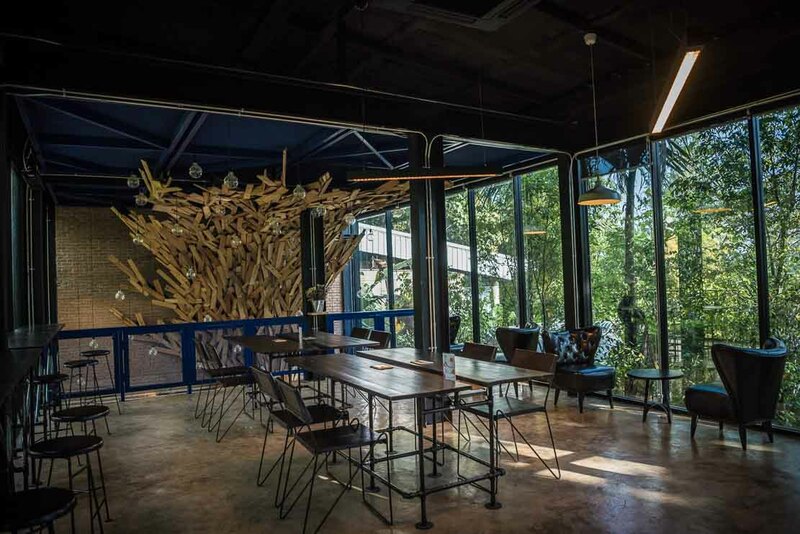 “Wake Up” became our favourite co-working space in Chiang Mai. 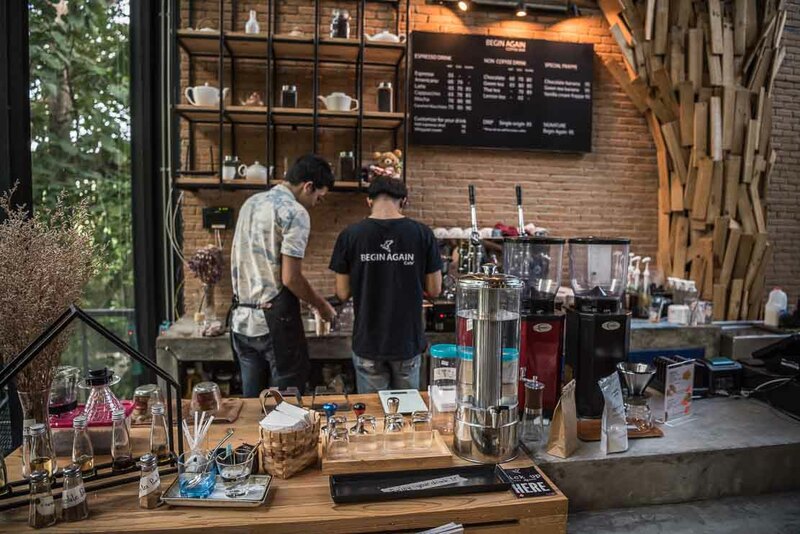 This is more a cafe than a co-working space. For a purchase of a drink or food (Wake Up shares a space with Subway, sandwich franchise), you are given Internet access for 4h. It’s very popular with Thai students but surprisingly quite. Many students use Wake Up to watch films or even have a nap. The third floor is the quietest area and it feels more isolated but if you like light and space, it’s probably not the best option. Wake Up has modern and original design, with some seating spaces resembling wooden cabins. We particularly liked Japanese style tables in the backside of the second floor. Seating on the floor made us coming back so many times! I was expecting Wake Up to have mediocre coffee – they aren’t baristas, after all. But surprisingly, their coffee is good. Another good option is Green Tea – real Matcha tea from high-quality leaves from Japan. For something interesting, try their signature dessert – Snow with Strawberry, Mango and other flavours, a refreshing dessert made from ice. For insomniacs – Wake Up is open 24 hrs. Location: Nimmanhaemin Rd, Soi 10, Chiang Mai, Thailand. Another branch of Wake Up is located nor far from the original Wake Up. With white walls, high ceilings, very spacious and very quite, this branch inspires to work and creates a nice relaxing atmosphere. With many seats along huge windows allow for nice natural light, and one can easily spend long hours here without being tired by artificial lighting. This branch doesn’t have Subway but has a variety of drinks to choose from. It’s also open 24hrs. Wake Up is a franchise. It has several branches in Chiang Mai but we didn’t try those. Location: Doi Suthep road, in front of Chiang Mai University, next to Malin Plaza, and in front of Elephant Cafe & Co-working, Chiang Mai, Thailand. 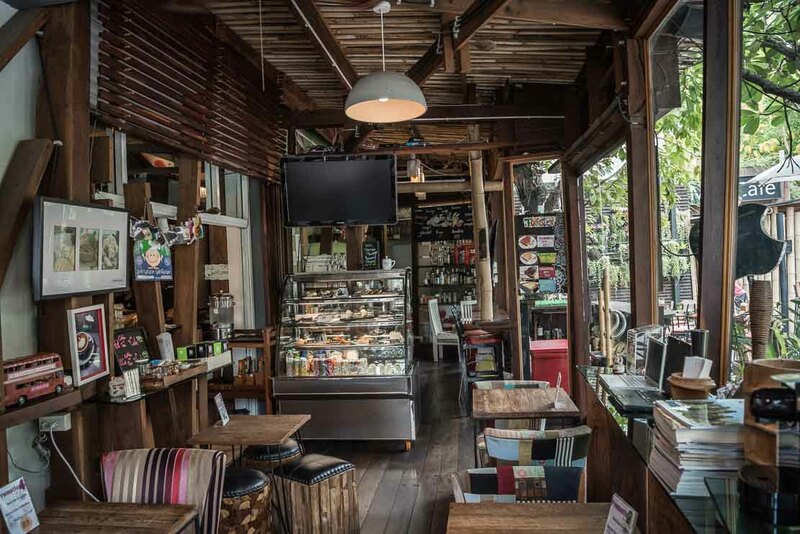 This is a cafe – Internet access is given against a purchase of a drink or food. 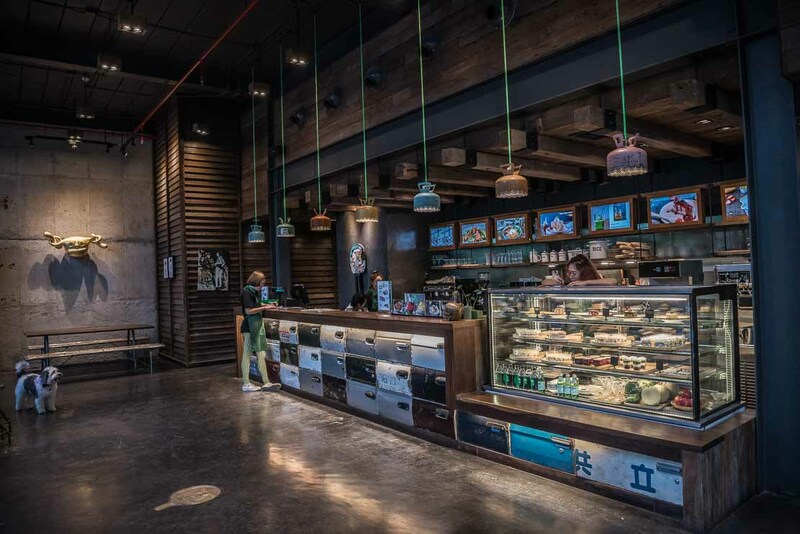 If not for work, one should visit Local Café for its unique and distinguished design. 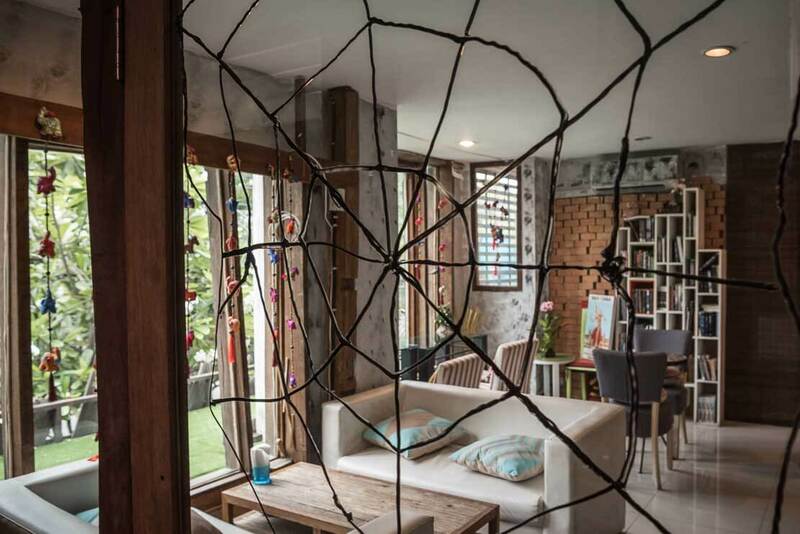 The contemporary decor artfully mixes the old and the new. 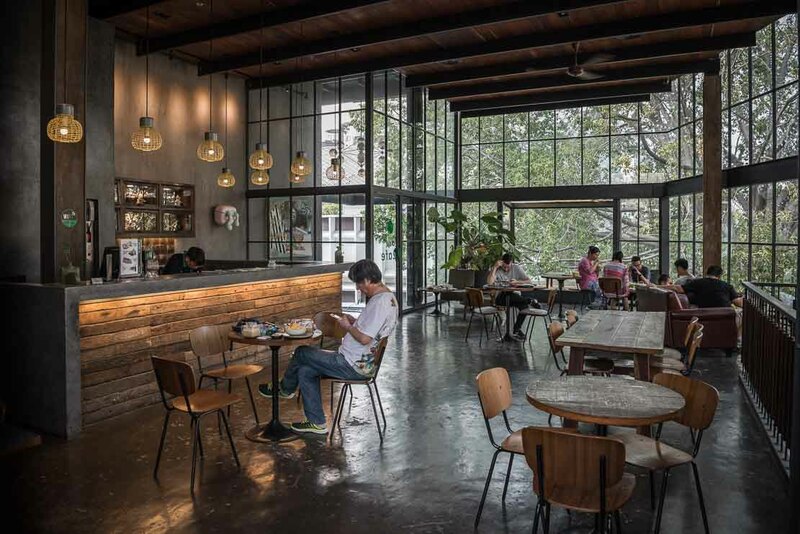 With its industrial feeling, huge ceilings, glass windows taking the space of the walls, and art-design furniture, Local Café definitely has a character. 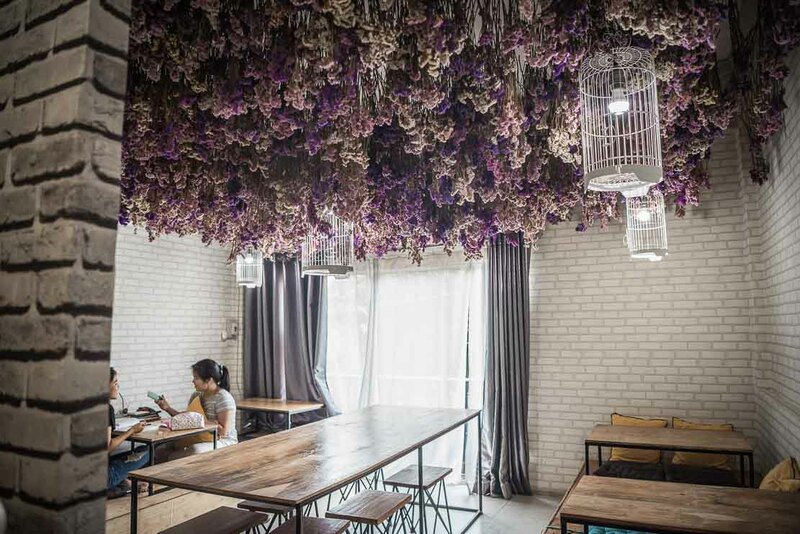 With a lot of light, an airy atmosphere, and fast wi-fi, the work becomes a pleasure here. Not only does it have unique design but also a creative menu – it’s hard to choose… Where else you can try the watermelon cake? Location: Nimmanheamin York Rd, Think Park, near Maya Shopping Mall, Chiang Mai, Thailand. We initially thought that they used Mac name just to be fancy. However, it turned out that this is a real Mac shop slash repair shop slash café slash bar. Interesting idea. 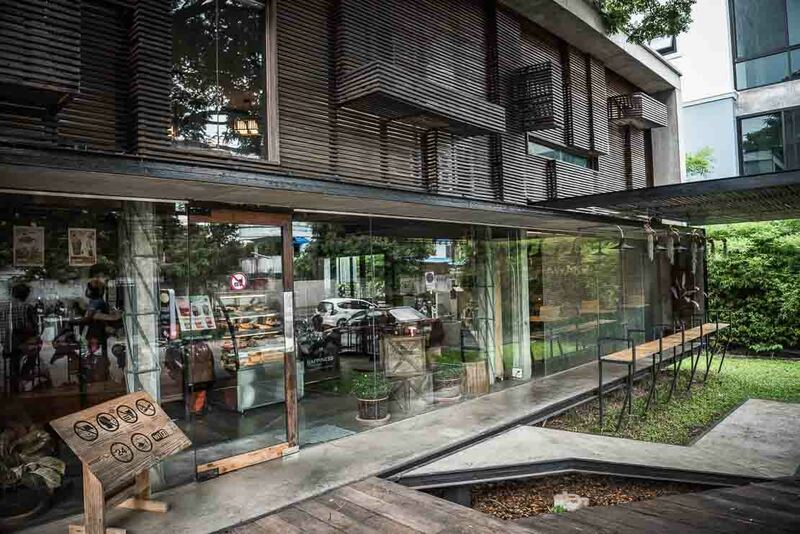 Located near Maya Shopping Mall, it’s modern, cosy and quite. The upstairs area looks like somebody’s living room. This is where we used to work, pretty much alone all the time. The ground floor has a nice area with very comfortable chairs and armchairs, and a Mac shop with brand new Apple computers and a great collection of old Mac. They serve drinks, cakes (sometimes they have the Mac tiramisu) and food. 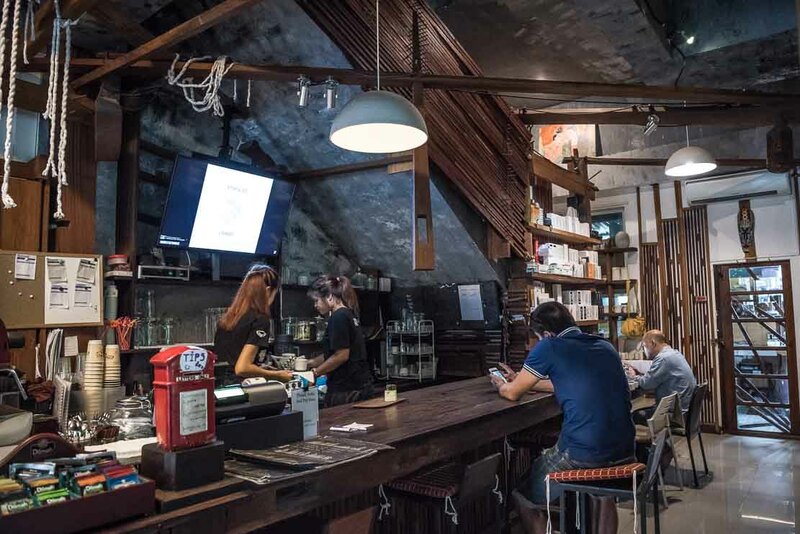 In the evening Mac Café turns into a bar with beer and other alcoholic drinks on sale. So, the best time to work there is definitely before 5 or 6 pm. Location: 233/1 Huai Kaeo (Huey Kaew) Rd, near Maya Shopping Mall, on the left after crossing the canal intersection, Chiang Mai, Thailand. 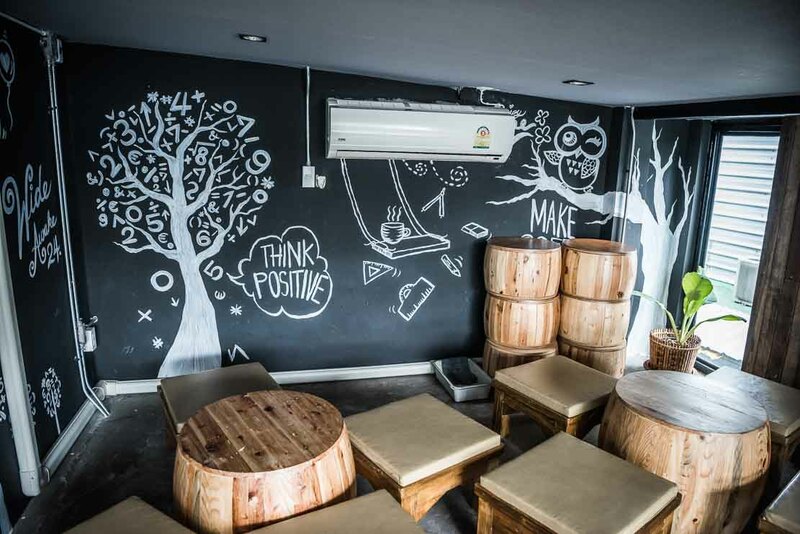 Very comfortable co-working space located near Chiang Mai University and near the second branch of Wake Up. 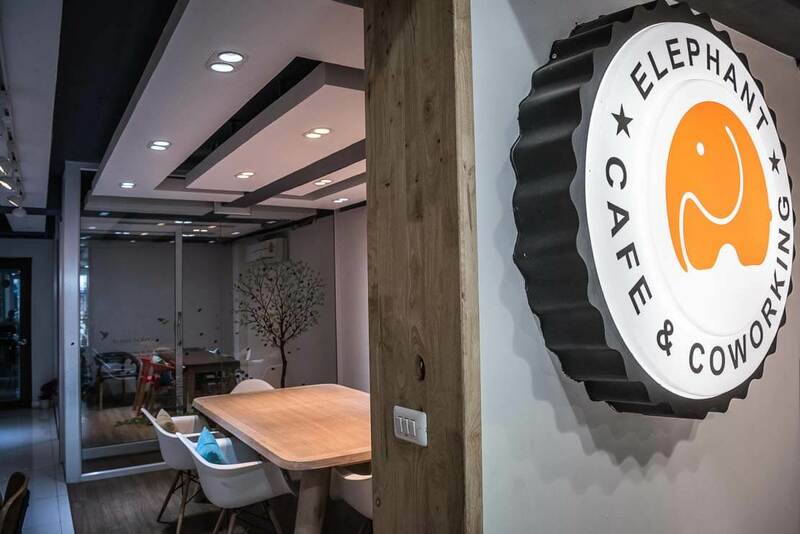 Despite its close proximity to the university, Elephant Cafe & Co-working is empty most of the time. If you are looking for a quite place, it’s one of the best spots. It’s is on a small side, with beautiful modern and minimalistic decor. You don’t pay a daily fee but buy drinks or snacks, which gives you access to Internet. Internet is good and the choice of drinks and cakes is very Asian – ubiquitous green tea, Thai, tea, some flavoured teas etc. The downside is that you have to log on with your Facebook, which may not be the best option if you want to stay incognito. But on the bright side, the cost of drinks is very reasonable compared to other places. Location: Doi Suthep road, near Chiang Mai University, Chiang Mai, Thailand. 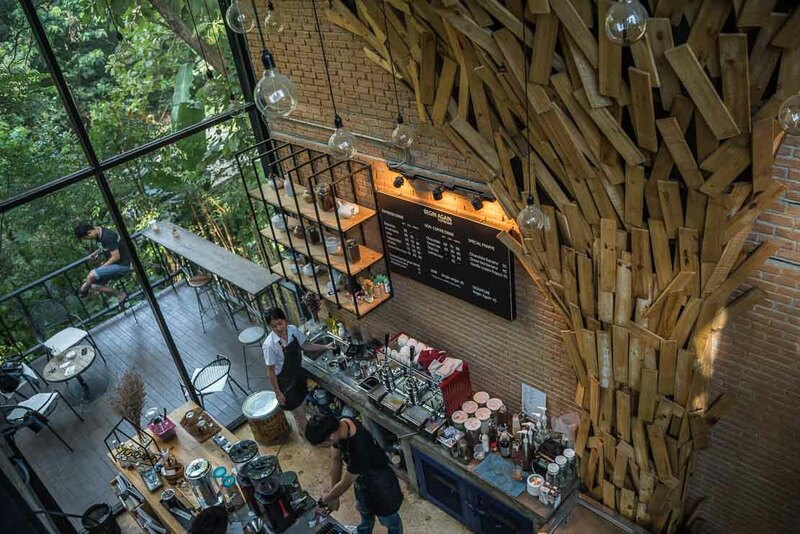 Imagine yourself sipping a coffee in the middle of a jungle. 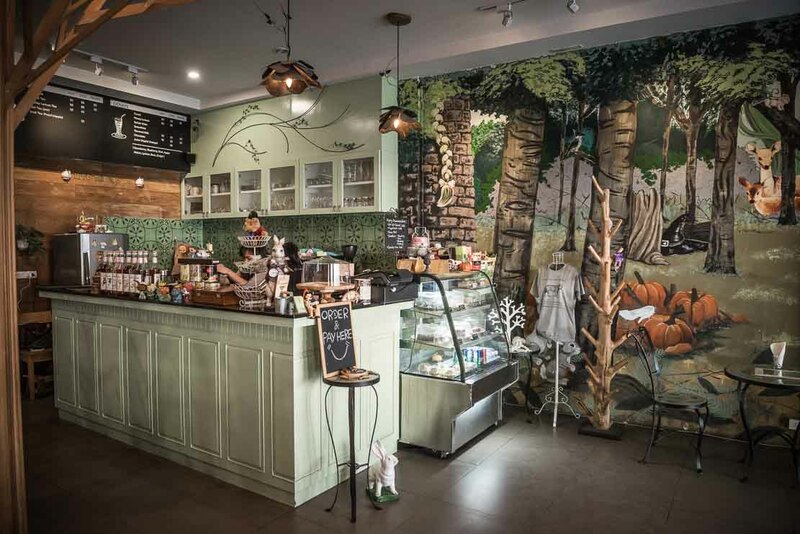 A little off-the-beaten path, Begin Again is a stunning cafe in terms of its location and decor. Entering through the big walls in front of the cafe, you are directly stepping into the nature. The design of the building is also unique – it’s built as a big glasshouse surrounded by a lush garden. 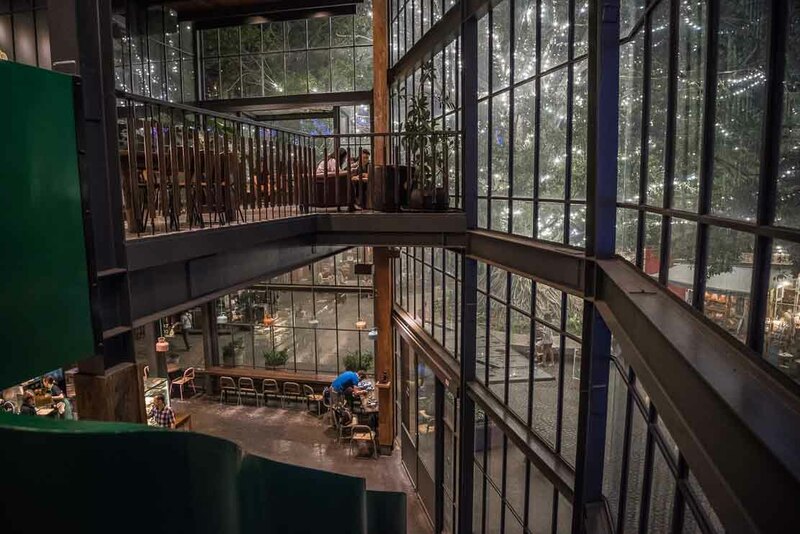 The interior is interesting as well, with modern steel and glass design, wooden art behind the bar and huge glass wall looking out into green surroundings. You can choose to sit inside, on the first or second floor, or head outside into the garden terrace to enjoy the “jungle” view. 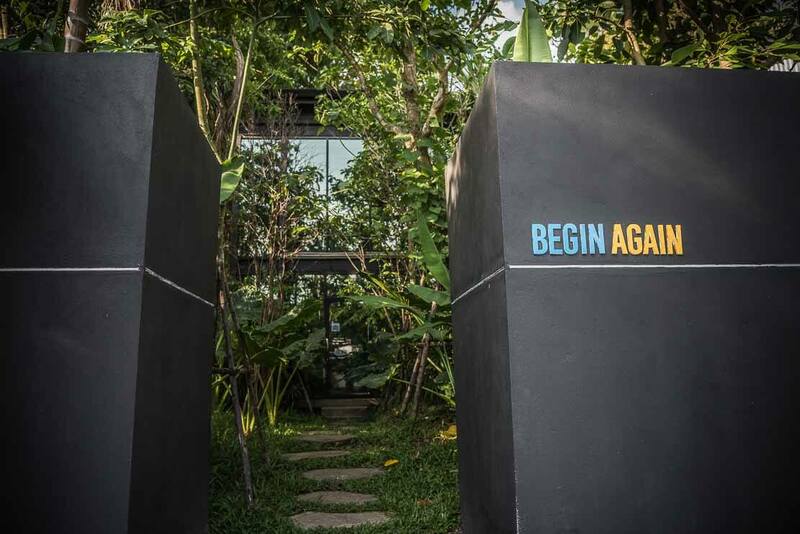 Begin Again Cafe is the new cafe in Chiang Mai, which quickly gained popularity despite its location (15 min drive from the city center). 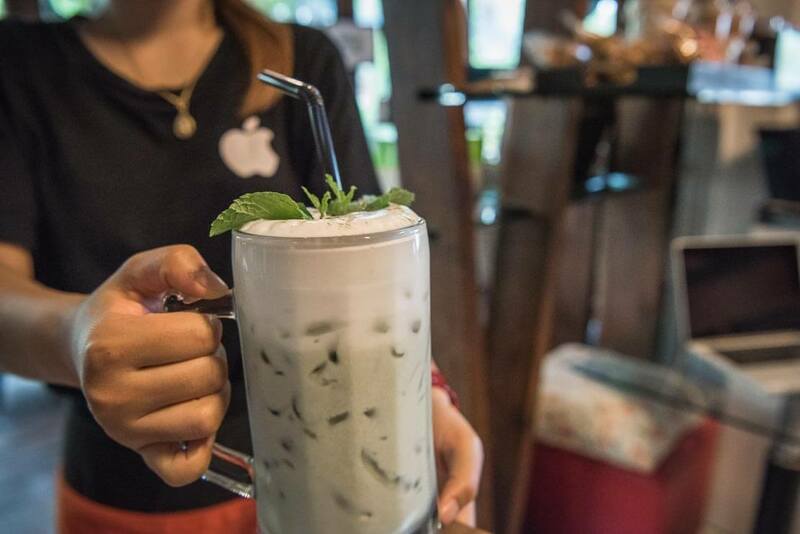 They offer coffee and tea, hot and cold, deserts and a bit of food, but they are famous for their green tea latte using Matcha powder from Japan. 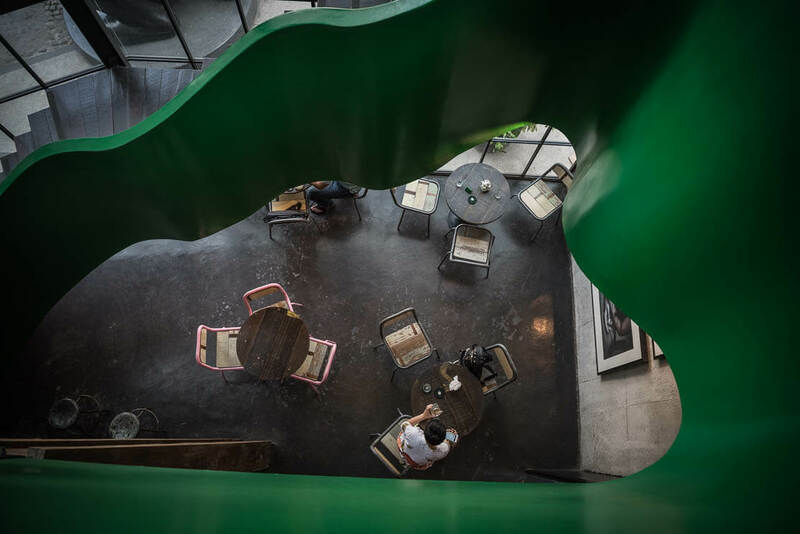 Begin Again is a place for those who love design, who seek to take a break from the hassle of the city and spend a day in a peaceful and relaxing place with a laptop and a cup of coffee or tea (or even better – green tea). Location:  located not far from Nimman road and Chiang Mai University. 85 Moo 5, Suthep sub-district, Chiang Mai, Thailand. 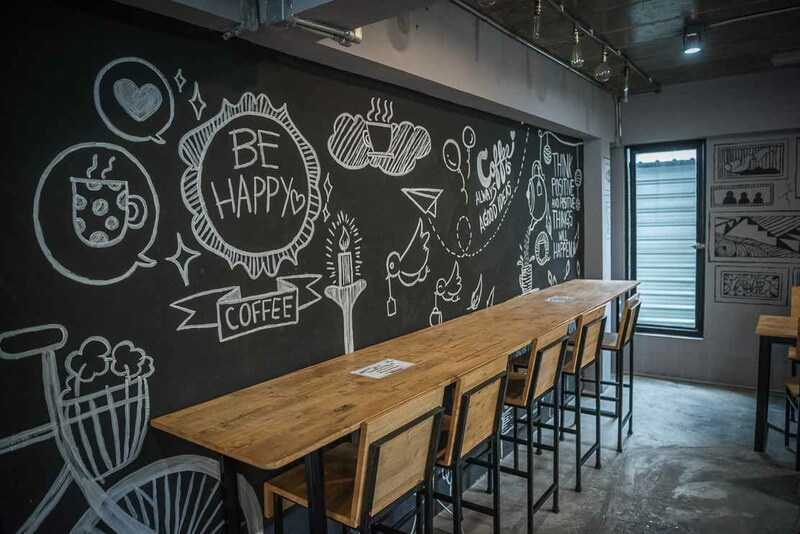 We discovered Factory Coffee on our way from Wat U-mong, a lovely cafe dimly lit on the first floor, with a large leather sofa and funny pictures on the walls. 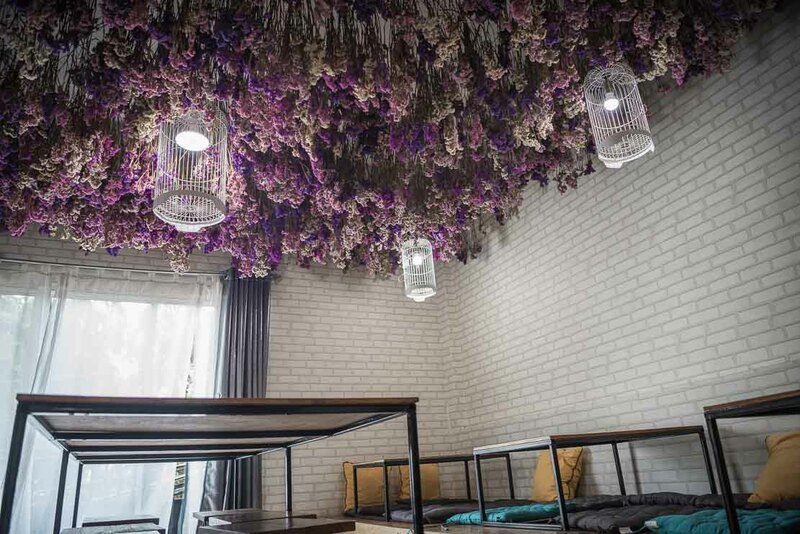 But the most interesting decoration is upstairs, with lavender hanging from the ceiling. This is where you will find local students pretending to work but mostly chatting to each other or napping. The space, with many tables and plugs, is perfect for working. Their lavender decor is beautiful, working conditions are perfect and coffee, both hot and cold, is surprisingly good and reasonably priced. Location: Soi U-mong, Suthep Road, Chiang Mai, Thailand. You love fairy tales and believe in Santa Claus? Into the Woods is the place for you. 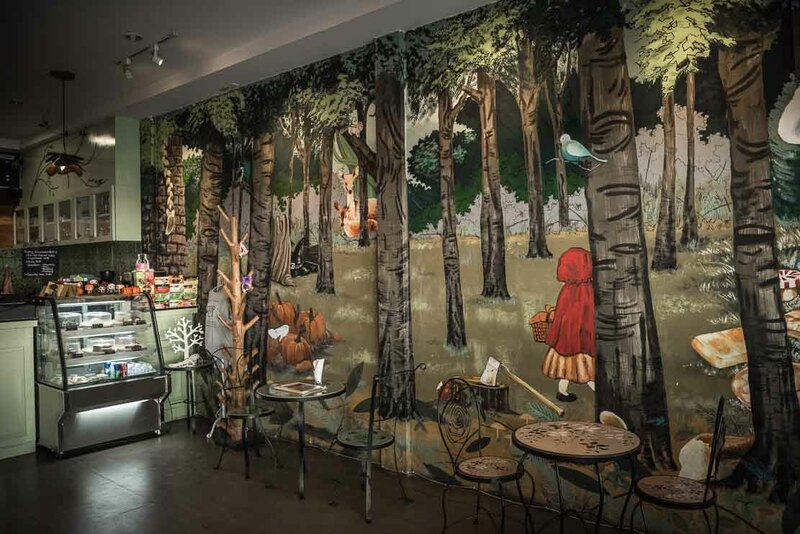 Walking in this cafe is like walking into a fairy tale – a colourful mural painting covers the entire wall with scenes from Little Red Riding Hood and other fairy tales, and man-made wooden trees “growing” up to the ceiling. Into the Woods is there to elicit memories of your childhood. This charming little café is spacious and quite, with most of the customers working or studying. 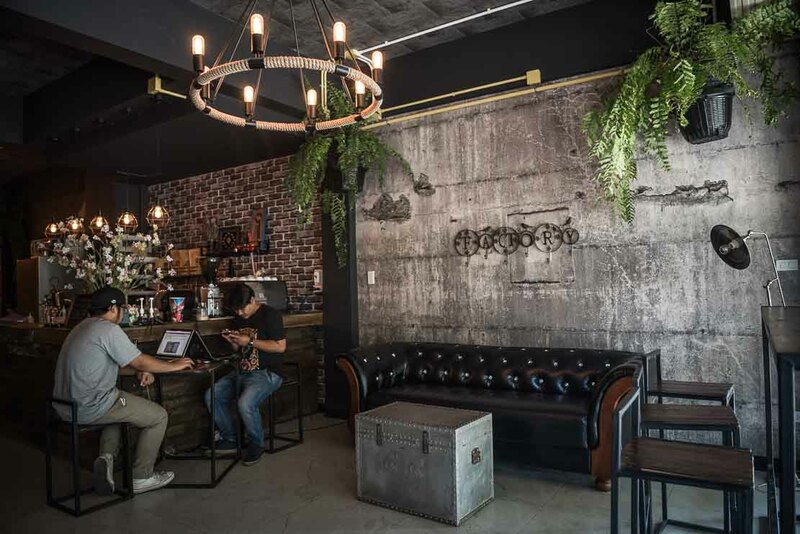 With its comfortable chairs and tables, including a bar-style seating along the window, and background music, so quite and relaxing that you hardly notice it, it’s a perfect place to work. There is also a comfortable couch in the corner and bookshelves full of books. You get Internet access against a purchase of drinks or food. 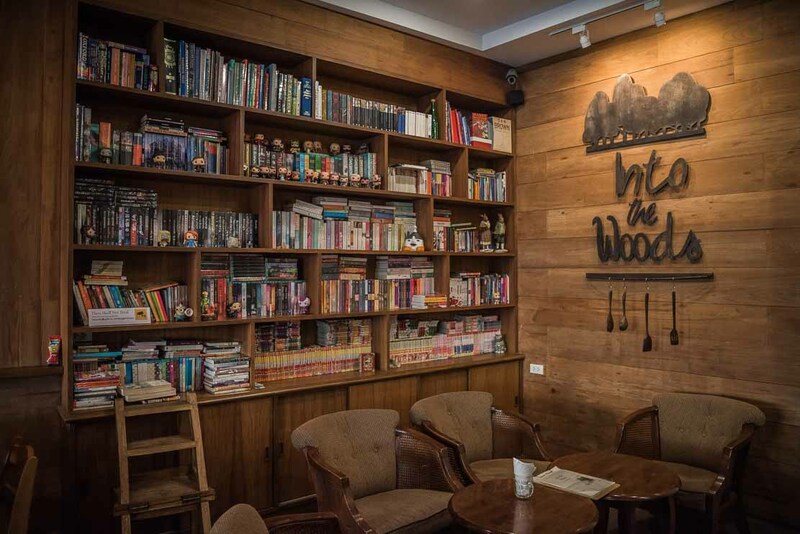 The menu is very reasonably priced for such kind of café, and includes a mix of Thai and Western food (the servings, although not huge, are delicious), and some creative drinks such as Sea Salt Caramel Latte and Into the Woods Latte. Location: in the Old City. 191-193 Prapokklao Rd, Si Phum, near the North Gate, opposite Chang Phuak food stalls, Chiang Mai, Thailand. 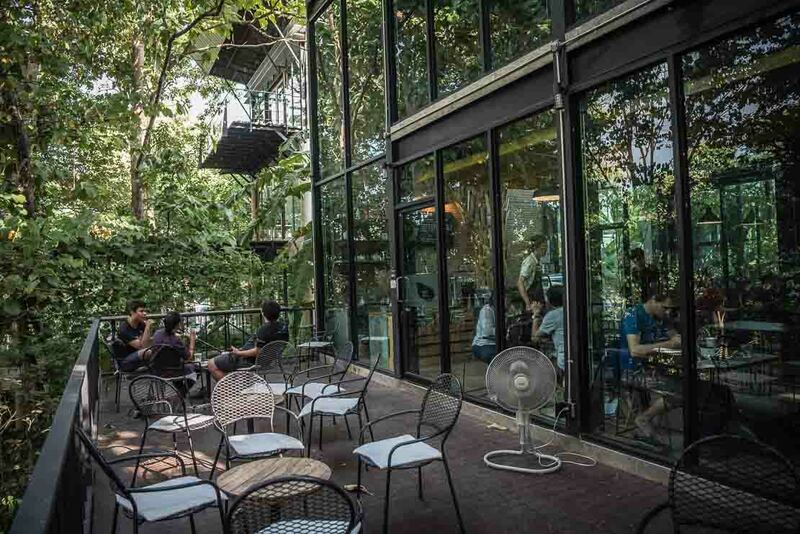 Located directly behind Punspace in the trendy Nimman area, Wide Awake is a great place to work. Although the clients are the students from Chiang Mai University, it’s surprisingly quite. They come here to work. 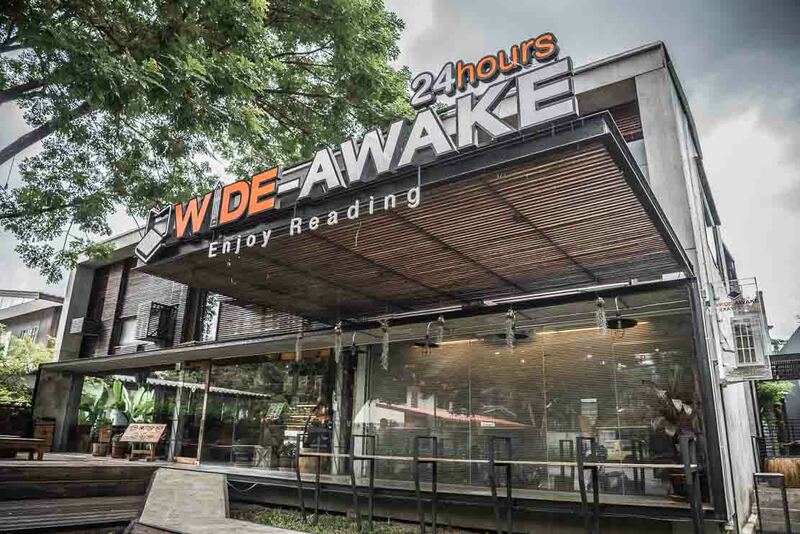 Although looking like a co-working space, Wide Awake is a cafe. It has no hourly fee – one is given Internet access against a purchase of drinks and snacks. 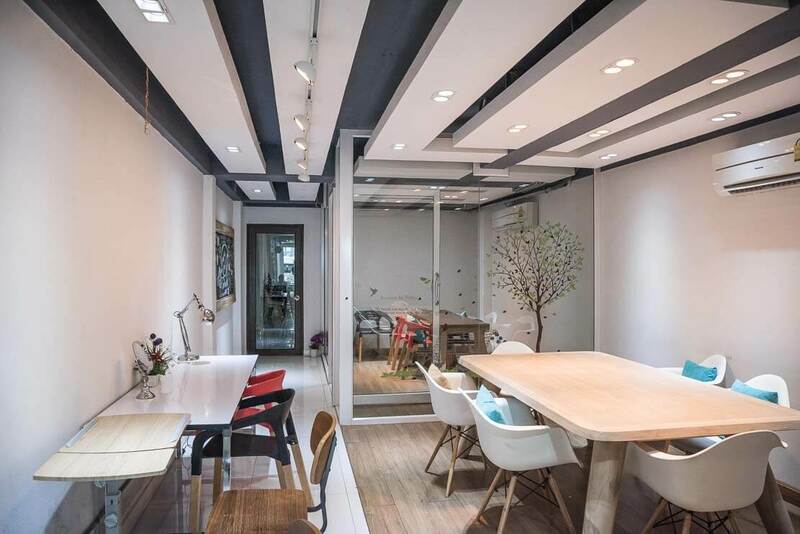 Modern design (they have very interesting design toilets with some kind of open roof), beautiful leafy garden that you can see from the window and a variety of seating options, inside and outside, Wide Awake create a perfect atmosphere for working. And it’s open 24 hrs! Location: 25 Sirirat Rd, Soi 13 Rajamangala Ecclesiastes, Chiang Mai, Thailand. The majority of the places use Facebook rather than a website, and the information provided isn’t always accurate. Also, the turnover rate in Chiang Mai is high. 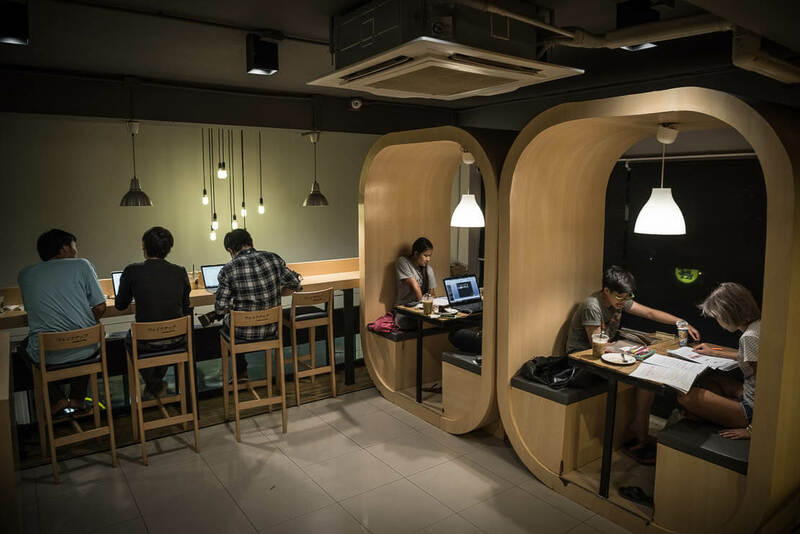 Co-working spaces and cafes are constantly closing and opening.